I’m taking a rather quick liking to Napa. The fact that damn near everything closes after 9pm is hard pill to swallow after my 24 hr/day/365 life in Vegas. But hey, maybe it’ll help me become a normal person who doesn’t run off to the gym and then grocery shopping at 3am. Actually this is highly unlikely to end as I’ve already sought out the two places in Napa where I can achieve this. Old habits die hard, right? Anyways I’ve been meaning to cook more since moving into my new place. Try and find out how this newfangled electric stove stuff works. (Long live the gas range!) But upon unpacking my belongings I realized I no longer own a saute pan??? Go figure. Disgruntled as I may be about this, I couldn’t bring myself to buy another saute pan, cheap or otherwise. So I headed down to the local kitchen supply store where I was united with the cast iron skillet I have long eyed but never purchased. Due in part to my stubbornness and in part to my laziness, I can imagine this will be my only sort of pan for some time. Probably until I get that All-Clad sponsorship or win some random instagram contest. Are those things even real? I’m always a fan of cooking seasonally, eating locally, and generally celebrating the native cuisine. I plan on testing out some more worldly recipes going forward, but today I present to you a rustic Napa inspired dinner. The weather here has been on again off again and while this dish may mirror more autumn flavors, I assure you it’s inspiration is in summer. One of the wonderful things about living in an agricultural based town is the readily available local produce. At least readily available if you happen to be a morning person. Hey, I’m working on it! But this morning I willed myself out of bed to wander the farmer’s market, just to bring you this post dear reader. Don’t say I never did nuthin’ for ya. Going grocery shopping with me is an ordeal. I try to explain this to everyone I know and they always suggest that I go in prepared with a list. At which point I gently smile through my teeth and divert the conversation. After all how did we get on the topic of my shopping habits in the first place. It’s not that I’m opposed to using lists. No, in fact I rarely shop without one. It’s just you never know which produce will look good or where inspiration will strike. Now I told this to the clerk who rang me up for my discounted day-old Russian fingerling potatoes and he asked me if I was an artist. I laughed nervously and told him, no I’m just planning on eating these potatoes. Shopping in general is usually an ordeal for me I guess. I’m just overly picky on what I’m going to spend my money on and trying to rationalize if I will need it. Always saving up for that next big trip, amirite? 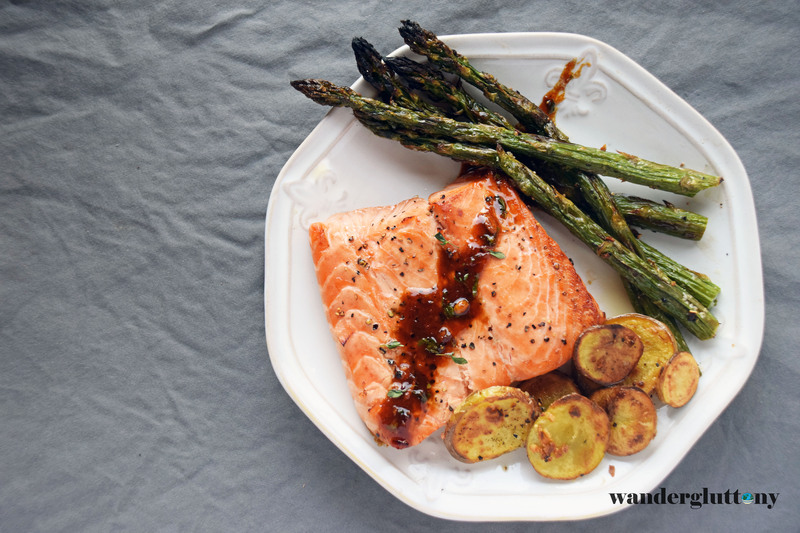 Enough with the rambling– I present to you this Chardonnay broiled salmon with roasted summer asparagus and heirloom potatoes topped with a Chardonnay pan sauce. Phew. It was 4 hours in the making, but 3.5 of those hours were dedicated to wandering aimlessly through aisles of fruits and vegetables only to have me steal a neighbor’s lemon and picking herbs from my garden upon coming home. If you can follow a shopping list better than I, this is a very quick yet impressive meal great for a back patio dinner date. Preheat your oven to the broil setting (cooking in the oven from the top, instead of the bottom). 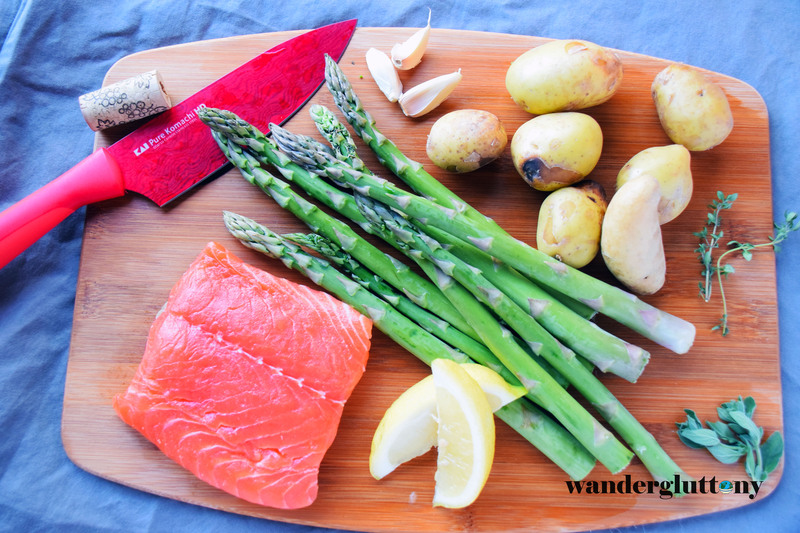 In a bowl toss together asparagus and slices of potato with sea salt, black pepper, and two cloves of minced garlic. Ensure to snap off or peel the skin of the dead ends on the asparagus and keep the slices reasonably uniform in thickness. Spread out the vegetables onto a baking sheet in one layer and place on a lower rack in the oven as you prepare the salmon. Preheat your skillet or saute pan on medium high until a drop of water will sizzle off the pan. Avoid using teflon/ non-stick pans or pans with rubber handles as you will be putting this pan into the oven soon. Season the fillet with sea salt and a touch of black pepper. When the skillet is sufficiently heated drop the salmon onto the well seasoned pan. If you’re using a normal saute pan (you lucky duck, you!) drop a touch of butter in the pan first to create a barrier between the pan and the fish to prevent sticking and ruining the fillet. Let the salmon sear for about 30 seconds before adding in about a cup of Chardonnay. The liquid should reach halfway up the side of the fish. You may want to add more wine for a thicker cut, but do not overfill the pan as we are not boiling or poaching the salmon. Too much wine also makes the sauce more difficult to reduce later on. When the wine comes up to a rolling boil (should be under 1 minute, if not turn up the heat), put the pan into the oven on a top rack, careful to keep an eye on it to not overcook the salmon. While you have the oven open I like to quickly flip the veggies over to ensure even cooking and judge if the rack needs to be moved up or down depending on speed of cooking. We want a nice charred roasted flavor here, but not burnt so if it appears to be cooking too quickly bump the rack lower away from the heat source. From here you probably have 3 or so minutes before your salmon is cooked to medium. Might be a good time to work through a sun salutation? Again a thicker piece of fish may take longer to be more thoroughly cooked. If this is the case or you like your salmon well done, keep more space between the top of the broiler and the salmon rack so you don’t burn the salmon with a longer cook time. When your salmon is cooked and developed a nice roasted top layer, carefully take out of the oven. I’d stand back and not inhale until the oven is shut or you will get a nice whiff of alcohol that will penetrate your sinus straight to the frontal cortex. Plate the fish and shut off the oven so the vegetables stay warm, but will not burn. In your pan you should have some toasty looking Chardonnay left, add the butter to it over medium low heat until it melts and reduces slightly. Add in fresh thyme, torn oregano, and a squeeze of lemon into the pan. If you find your sauce is too thin you can add a teaspoon of flour to create a sort of roux. Just ensure to cook the flour down so you do not taste the flour as a component. 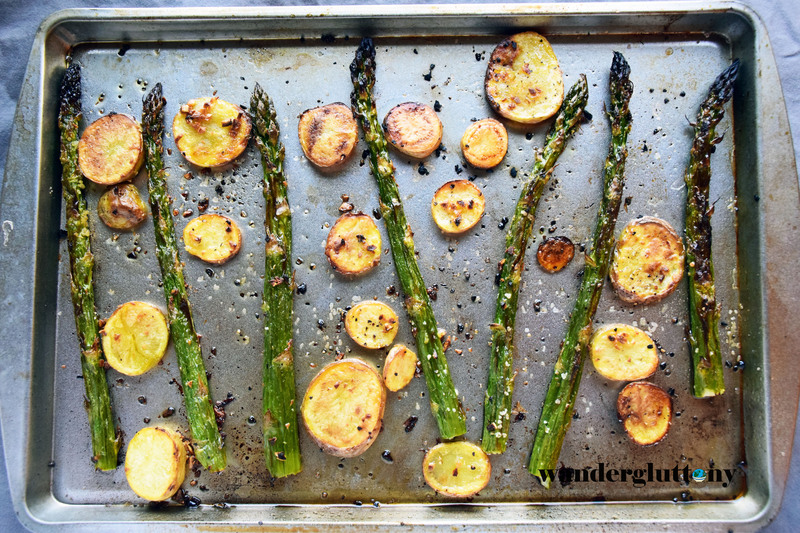 Plate a few stalks of roasted asparagus and fingerling potatoes, and garnish with a touch of the pan sauce. A little of this stuff goes a long way, so don’t overload your plate with too much sauce. Pour yourself a hefty glass and fill up your tummy Napa Style! Be the first to know! Enter your email address to subscribe and receive notifications of new posts to your email. Stay updated with an email reminder when there's a new post!